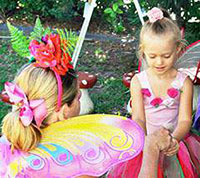 What sets The Fairies Toadstool Fairy Tea Parties apart from similar companies? As the Creator and owner of The Fairies Toadstool it is important to me that my tea parties are of a high calibre in planning, detail and entertainment. As a mother of 4 beautiful children it has given me full time, first-hand experience of what it takes to really entertain children. How do I book a Fairy Tea Party? Call 0414 942 400 or complete the form under the "Enquiry Form” tab to reserve your party. A confirmation will be emailed to you, which needs to be completed & submitted back to us within 5 days to reserve your party. Along with a $50.00 non refundable deposit. Where Can I have my Fairy Tea Party? Any where you like; I am completely mobile. Just ensure on your booking form you advise whether your party will be indoors or outdoors. Can you organise My Fairy’s Birthday Cake? Yes we can. I work very closely with the lovely ladies from Buttercup Cakes in Cooroy who have a beautiful assortment of yummy, affordable cakes for your little fairy. If you require us to organise your cake please let us know on your booking form. Can you organise and send out my Fairy’s Tea Party Invites? Yes. The Fairies Toadstool can organise beautiful Fairy Tea Party invites for your special fairy. You will need to book your Fairy Tea Party in enough time to have the invites written up and sent out as well as enough time for your guests to RSVP. I suggest at least 2-3 weeks before your selected party date. Please refer to Packages Extras for prices. Does your entertainment include boys? Yes. My Fairy Tea Party does include boys, although mostly fairy or girl-themed, I do offer elements of pure children's entertainment. Additionally, I do incorporate boy themes into my Fairy Tea Parties, so they often have just as much fun as the girls. What is the best time to start my party & start the entertainment? I suggest that Fairy Flutter arrives no later than 30 minutes into the party so that late comers don’t miss out. The making of fairy dust/fairy craft and tattoos etc does take time, so it is best to plan to serve the food then. This will keep the little ones busy whilst they are waiting. How will my party be confirmed? I will call you at least 3 days prior to your scheduled party to confirm all of the details with you, including your RSVPs. I might also need arrange a time within those 3 days to come out and check the location of the party to ensure set up on the day goes without delay. When do you need to know my RSVPs? We need to know your final count when we call you 3 days prior to the party. Adding on last minute RSVPs cannot be guaranteed. However I will try my hardest to accommodate all requests. What age child "counts" in my RSVPs? 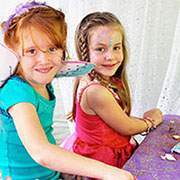 If you think the child will participate in fairy dust making, fairy craft, makeup or a tattoo and would like to receive a party bag then you should count them. 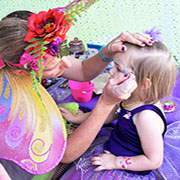 We will accept cancellations up to 3 days prior to your booked Fairy Tea Party date with no extra charge. Cancellation within 3 days of the scheduled party date will incur a $50.00 cancellation fee. What type of set-up do you require? As I host my Fairy Tea Party in my fairy grotto I will require a clear space of 3mtrs x 3mtrs outside. If the party is hosted inside I will be unable to use the fairy grotto but will work my fairy wonders to create a wonderful fairy tea party inside. (All props etc are included in the package rate). What if you want Fairy Flutter to stay longer? If my day's schedule allows, I will gladly accommodate such a request. The additional rate will be $25 per 15 minutes. How long will it take to set up on the Party day? I will normally arrange to set up at the party location at least 2 hours before the party is due to start. How will I know when you are about to arrive? So Fairy Flutters entrance is extra special and a surprise; I will contact the host via txt message about 5 mins before I arrive. When is my final balance payable for my Tea Party? Within 2 days after Fairy Tea Party Date. This is payable by cash, cheque, direct deposit. Can we use the Fairy Grotto for the remainder of the party? Unfortunately no...The Fairy grotto is only available for use during Fairy Flutters allotted time. It will be removed after the completion of the paid time with as little disruption to the party as possible. Do you travel outside the Sunshine Coast Area? Yes. 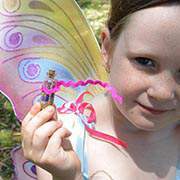 Fairy Flutter is more than happy to spread her wings and fly to wherever you would like to have your Tea Party. A surcharge of $100.00 is applied to any parties located in Brisbane. For any other destinations outside of Brisbane please contact us for a quote. Do you have a Blue Card? Yes, I hold a current Queensland Blue Card. Yes. We are covered for public liability insurance.